New York, NY—January 6, 2017— Marvel is proud to announce that, beginning February 2017, all Marvel digital redeem codes found within the pages of Marvel Universe titles will unlock two or more BONUS DIGITAL COMICS on the Marvel Comics app for iPhone®, iPad®, iPhone® and select Android devices* at no additional cost! Starting this year with Marvel Universe titles (excluding all-ages comics), only available within your local comic shop, the Marvel digital code will be upgraded to unlock two or more additional digital Marvel comics – stretching your dollars’ worth! 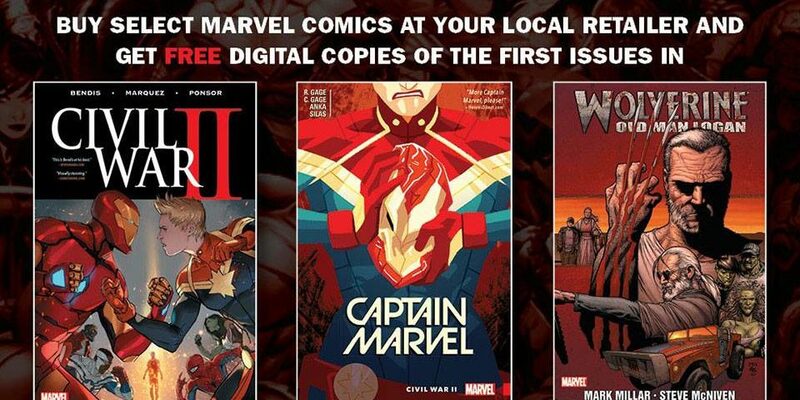 Beginning February 1st, Marvel fans that enter the doors of their local comic retailer will now be rewarded when they purchase Marvel titles with a digital code that unlocks existing moments into the Marvel Universe they may have missed in the past. Marvel’s BONUS DIGITAL COMICS will be updated weekly with consistent in-print and social messaging so fans know which BONUS DIGITAL COMICS will be made available that week. So find your local comic shop by visiting comicshoplocator.com and get ready to experience new gateways into the Marvel Universe you may have missed in the past available through the comics you already read. Marvel’s BONUS DIGITAL COMICS, available only in stores, are your keys to new corners of the Marvel Universe you’ve never experienced before. Prepare for the adventure! *Compatible iPhone®, iPad®, iPod touch® and select Android devices. See the App Store or Google Play for compatibility information. Next article Star Wars Rebels: Rebels Recon for "Ghosts of Geonosis"